WINNING the Southern Tasmanian Junior Football Association's Under 17 women's best and fairest award was quite the birthday present for New Norfolk's Perri King. King turned 14 on the day of the STJFL best and fairest award night last month. The New Norfolk Under 17s women's team member took out the league award with 22 votes, five clear of her nearest opponent. To play in an Under 17 team at age 14 is one thing, but to take out the association best and fairest is another and the accolades don't stop there. King is also the brainchild behind the women's football team becoming a reality. After a number of chats with her school bus driver, NNJFC coach and long-time local football administrator David Banks about wanting to play football, David suggested that Perri's dad, Dean King, could be the coach and that's what happened. With a full list of keen as girls and a band of helpers, the NNJFC soon had its girls' team. Congratulations Perri on your best and fairest award. Your will to achieve is just fantastic, and you certainly have proven that dreams do come true. 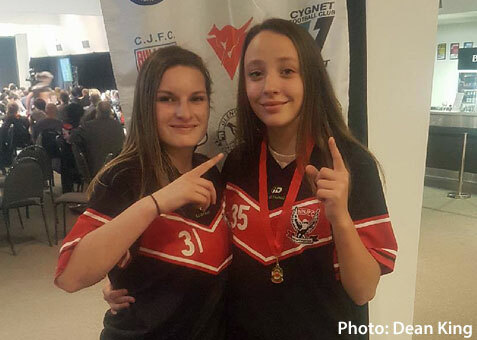 PICTURE: STJFL Under 17 Girls Best and Fairest Winner Perri King (right) with team-mate Charlie Lovell who also did well, finishing fourth.